Wilwood Dynalite BBK ACURA - Brakeswap.com - Friction for the Win! Dynalite Big Brake Front Hat Kits are engineered for use in conjunction with the OE front hubs on sport coupes, sedans, compacts, and light duty SUV’s. These kits are loaded with cutting edge disc brake technology and backed by Wilwood’s 25 year tradition of building championship brake systems. Forged billet Dynalite calipers with PolyMatrix brake pads, machined aluminum hats, and 12.19” diameter vented iron rotors exemplify high-tech style and track ready performance. These kits provide Big Brake stopping power and are the perfect compliment to wheel, tire, and suspension system upgrades. Forged Billet Dynalite FDL Calipers (Calipers available in Black or Red) FDL calipers are the newest and strongest in the class. Stress-flow forged billet bodies and a highly efficent radial transition design are key elements contributing to the superior strength and performance of the FDL. This innovative caliper incorporates proven performance features from other Wilwood designs. FDL calipers generate high clamping force without deflection from four stainless steel pistons. Stainless is used to resist corrosion and reduce heat transfer from the pads. Square faced o-rings provide long service and positive piston retraction on release. FDL calipers feature Wilwood’s SRS stainless steel bridge plates to eliminate the bridge wear caused by pad gouging and extend the service life of the caliper. The spring-loaded action of the SRS plates also eliminates pad rattle and dampens the vibration harmonics that contribute to pad squeal. The 1/8” NPT fluid inlet is easily adapted to all types of flexlines. Internal fluid passages evenly distribute pressure to both sides of the caliper. Four corner bleed screws assure simple and effective bleeding regardless of caliper location. The top loaded brake pads can be easily inspected and serviced without caliper removal. 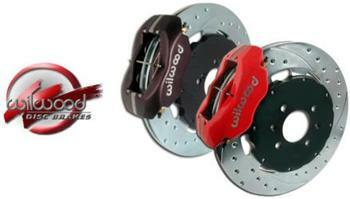 Standard kits include calipers with Wilwood’s signature and a black anodized finish. These kits are guaranteed to catch the eye and win the favor of the most discriminating enthusiast. GT Series Rotor Mounting Hats GT aluminum hats are lightweight and strong to handle the exceptional brake torque generated by the FDL Big Brake system. The hats are specially designed for use on the OE hubs without modifications or interference to the suspension or ABS components. The hats carry Wilwood’s signature and a black anodized finish that prevents corrosion and enhances the overall appearance of the complete package inside the wheel. SRP or HP Series 12.19” Vented Iron Rotors 12.19” vented iron rotors add stopping power and cooling capacity over smaller diameter OE rotors. All Wilwood rotors are manufactured from premium grade, long grain carbon iron to provide long wear with high thermal stability and resistance to distortion. The superior heat absorption and dissipation qualities of a vented iron rotor are essential to preventing heat fade and realizing the longest service life from the pads and rotors. Every kit in this group includes a 12.19” diameter SRP or HP series rotor. For custom, show, and high performance sport driving, SRP rotor kits offer the high-tech look and improved performance of a directional cross-drill and face slot pattern. In addition to their aesthetic appeal, the venting and cleaning action of the holes and slots will reduce pad glaze, dissipate surface heat, and minimize irregular pad build-up on the rotor faces. The results are smoother engagement with improved consistency and response at the pedal. SRP rotors are treated with a silver zinc wash to reduce corrosion on the areas of the rotor not kept clean by pad contact. HP rotor kits include close tolerance machined smooth face rotors. The additional mass of the HP rotor extends service life on heavier competition vehicles and severe duty applications subject to higher sustained operating temperatures. PolyMatrix Brake Pads PolyMatrix 7112 “Q” compound brake pads operate at the lowest noise and dust level of any performance pad. “Q” has fast response, high resistance to fade, long wear, and the low rotor abrasion that PolyMatrix is so well known for. Caliper Brackets and Hardware Aluminum mount brackets with steel threaded bolt hole inserts are lightweight and strong. Each bracket is CNC machined for precise fit on each specific spindle. Grade 8 strength or higher nuts, bolts, washers and alignment shims are included in each kit. Plumbing Fittings and flexlines to install these brake systems must be ordered separately. Applicable hose kit part numbers are listed next to the kits in the ordering information. NOTE: Installation of Wilwood Disc Brake Kits may affect the wheel offset.